LulaBelle aka Kiko loves many things about the holidays – knocking ornaments off the tree, shredding wrapping paper, harassing relatives, etc. 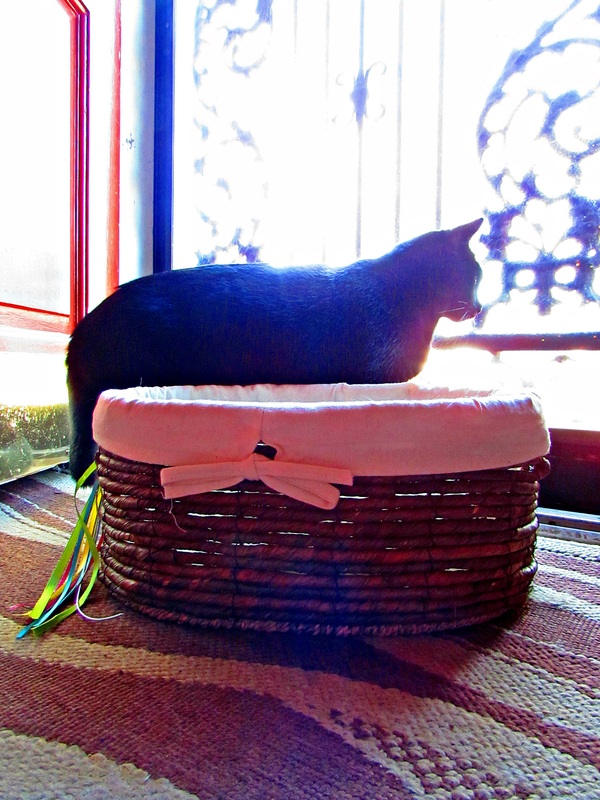 Her very favorite thing about Christmas is a basket that I bought when she was kitten. There’s nothing particularly noteworthy about this basket, but she adores it. The day that I brought the basket home, before I could even take it out of the shopping bag, I found Kiko laying in it. Yes, snuggled up inside of the basket inside a plastic bag. That’s my cat! When I brought the holiday decorations down from the attic this year, I caught her nosing around the tubs. I opened the one with the basket and left the room, not giving it a second thought. When I came back into the living room, Kiko was trying to worm her way into the basket. I tried my best to keep her out of the basket once the house was decorated, and I failed miserably. 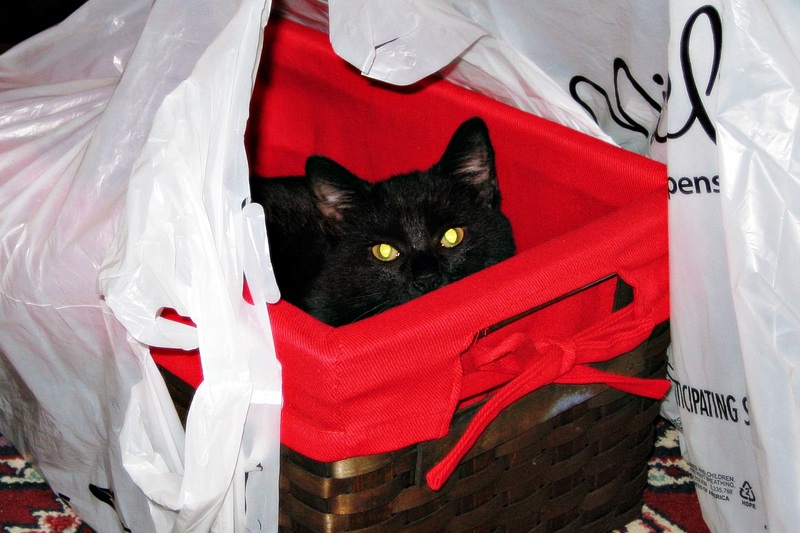 Anytime that I couldn’t find Kiko and called her name, I would see two, black ears emerge from the basket. Eventually I gave just gave in. I figured if it made her that happy, I should let her enjoy the basket. Plus it has a canvas liner, so I could wash all her beautiful, black hair off at the end of the holiday season. With the holidays winding down, I was itching to pack away the decorations and return my living room to its normal setup. My boyfriend tried to convince me to leave the basket out for Kiko. I love her, but the last thing that our living room needs permanently adorning it is a Christmas basket. So began the quest for a Kiko-sized basket with a washable liner. Eventually we found one at Home Goods. 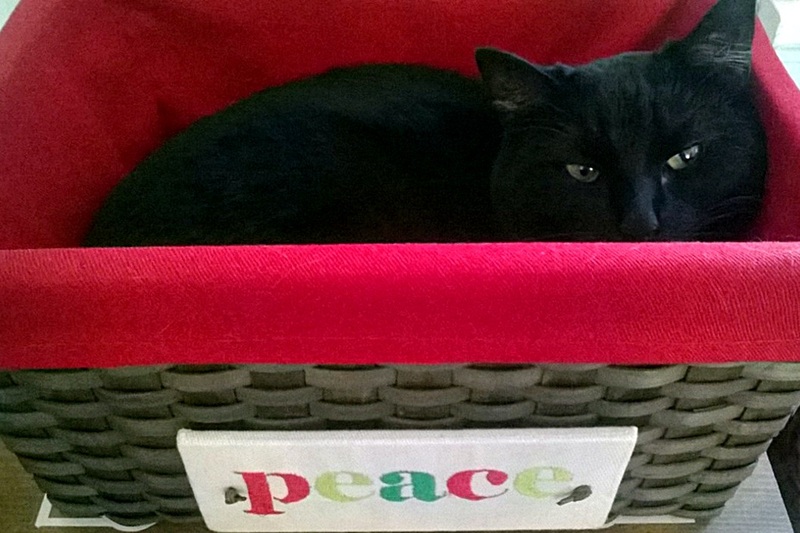 I’m hopeful that this basket will keep Kiko happy until the Christmas basket returns next November. To entice her, I added some ribbons to one handle of the basket. A little bribery never hurts. Happy pet parenting!